The Hoopoe is known in France as the huppe, and in Latin the Upupa, these names having apparently been given to this interesting bird from its cry. The hoopoe has been long celebrated in literature, and is renowned by its variegated plumage and its large erectile crest (From which is derived the secondary meaning of the French word huppe - a crest or tuft). 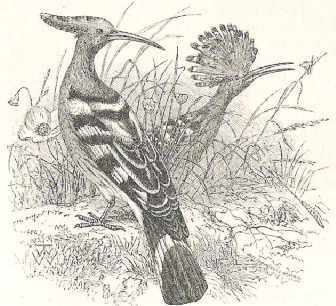 The Upupa epops, which is the species generally referred to by the name hoopoe, is part of the very peculiar Family Upupidae. This species has a very wide range in the Old WorId, being a regular summer visitor to the whole of Europe, in some parts of which it is abundant, as well as to Siberia. In Autumn it usually retires southwards to winter in equatorial Africa and India, although it would appears to be resident throughout the year in China and North-Eastern Africa. The bird seems to like a habitat where there is open ground, spending a lot of its time on the ground itself. Its power of wing generally seems to be feeble; but it is capable of considerable extended flight, as is testified by its wandering habits, the hoopoe occasionally appearing in places very far removed from its usual haunts. Its flying abilities are also demonstrated by the fact that when pursued by a Falcon it will quickly rise to an extreme height and often effect its escape from the enemy. The Hoopoe makes its appearance in some part or other of the UK each year, most often in spring, although very few instances of the hoopoe breeding in England are recorded. Eight or nine so-called species of the genus have been described. As well as the Upupa epops , the most well-known are Upupa indica, resident in India and Ceylon; Upupa longirostris, which seems to be the form of the Indo-Chinese countries; Upupa marginata, peculiar to Madagascar; and Upupa africana or minor, which inhabits South Africa to the Zambesi on the east and Benguela on the west coast. In habits and appearance they all resemble the Upupa epops, with only minor differences.